Course Description: This course is designed to develop the oral communication, reading, writing, and media literacy skills that students need for success in their secondary school academic programs and in their daily lives. Students will analyse literary texts from contemporary and historical periods, interpret informational and graphic texts, and create oral, written, and media texts in a variety of forms. An important focus will be on the use of strategies that contribute to effective communication. The course is intended to prepare students for the Grade 10 academic English course, which leads to university or college preparation courses in Grades 11 and 12. A diverse collection of short stories provides students with the opportunity to read a wide variety of texts and to explore, discuss, and write. Topics focused on include P.A.C.T.S, scaffolded activities to prepare students for future essay writing which includes utilizing a constructed response strategy, integrating support into writing, and deeper analysis of text. Students will be introduced to rhetorical devices and will create a media assignment to demonstrate their understanding how how it is used in literature. Interactive activities and games will help students review and learn new grammar rules and essay writing strategies. Students will learn how to successfully write a thesis and a blueprint to prepare them for their essay writing. Students will also practice skills they will need for the Grade Ten Ontario Secondary School Literacy Test (OSSLT such as multiple choice answers, identifying the main topic of a selection and identifying supporting ideas. Students will read a longer work of fiction and participate in lessons and activities to become familiar with the era of The Great Depression, explore various themes, write a character analysis, create presentations and discussion topics where they will evaluated on observation and conversation and finally write their first formal literary essay with focus on structure, developing a strong thesis and blueprint, using a variety of sentence structures in their writing and finally integrating transition words and phrases to improve the flow and quality of their writing. 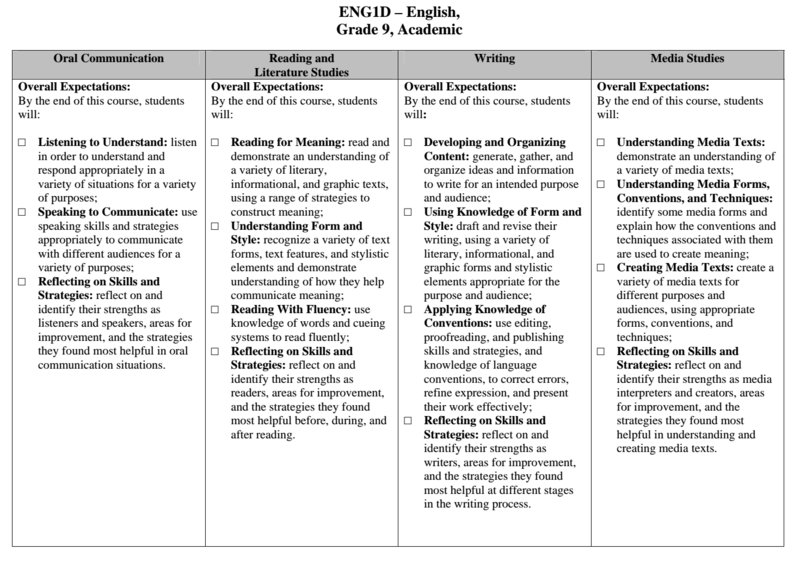 As this will be many students first time writing a formal literary essay, there will be direct and constant feedback from the teacher throughout the process. Shakespeare’s Romeo & Juliet (both the play and modern movie remake) will introduce students to William Shakespeare and one of his well known tragedies. Students will be introduced to the history of William Shakespeare, the Elizabethan era and the language used in Shakespeare’s writing. Students will create media, write a film review, role play as a character on Twitter and write their final literary essay. This essay will not only focus on the structure, grammar, sentence structure and word choices, but the teacher will formally evaluate and assess the student’s ability to critically analyze the play, characters and themes.